I started to call this post “The Unbearable Lightness of Thomas Friedman” but discovered that the NY Times columnist had already been the subject of not one but two articles similarly titled. Likewise a play on the title of Friedman’s most recent lightweight book was also taken (“Hot, Fat, and Clouded”). Friedman has been at the Times for 30 years now, winning three Pulitzers during his tenure, and is actually a year younger than single-Pulitzer-winner Maureen Dowd–though you’d never know it from their pictures. Not surprisingly, therefore, Friedman has attracted his share of slings and arrows over the years, enough so that coming up with an original line of attack challenges the would-be critic. That the Times continues to feature the twin mediocrities of Friedman and Dowd in such coveted positions as columnists for the newspaper of record surprises more, although given Friedman’s ability to popularize his goofy insights into bestsellers, perhaps not much. A few years ago I attended a lecture at a major university where the chancellor started quoting from Friedman’s work as justification for the way this chancellor wanted to re-orient the university’s research thrust. I was aghast, thinking that research universities were supposed to be cutting edge–not relying on the pithy platitudes of a columnist no one with a four-year degree, much less Ph.D., should mistake for an intellectual. If I had reasoned like the typical Friedman column, I would have taken the chancellor’s statement as indisputable proof of the decline of the nation’s graduate system, rather than the buzz-word babblings of a single pop-crunching administrator. Since then, Friedman has continued his embarrassing effort of going through the editorial motions, including his frequent paeans to authoritarian China and typified by his latest column, “Pharaoh Without a Mummy.” Any Friedman column is a trove for the would-be Fisker, but this trite stab at something other than a collection of the most banal observations regarding Egypt particularly so. One thing I can tell you about Egypt: It is not Las Vegas. The ponderous avoidance of the contraction does not suffice to give the gravitas to the thought Friedman desires. For one, perhaps it has escaped his notice, but Egypt is a country, whereas Las Vegas is a city, so the valid comparison would be Cairo and Las Vegas. That he need clarify the distinct identities of the two implies Friedman prefers, while in Vegas, to frequent the Luxor. What happens in Egypt does not stay in Egypt. For the last 30 years, that has been the bad news. Egypt was in a state of drift and decline and, as a result, so was the Arab world at large. Egypt has now been awakened by its youth in a unique way–not to fight Israel, or America, but in a quest for personal empowerment, dignity and freedom. In this part of the world, people have very sensitive antennae for legitimacy and authenticity because they have been fed so many lies by their leaders. I don’t see what’s “unique” to Egyptian youth about “a quest for personal empowerment, dignity, and freedom.” Nor do I see how living on a steady diet of lies causes anyone to grow truth “antennae.” If that were the case, North Korea would be overrun with bristling human lie detectors. Which democratic revolutions can Friedman list that were not homegrown? A coup might be instigated by foreigners, but a “democracy revolution”? Worse, how does the relative casualty rate of the “young people” involved versus the Egyptian Army have anything to do with it? If Egypt had fought a high-casualty war in the last 30 years, the legitimacy of this revolt would diminish? The quoted sentence should not make it past the most elementary copy editing. and that is why, if it succeeds (and the odds are still long), other young Arabs and Muslims will emulate it. One would think other young Arabs and Muslim would more likely risk emulating a movement that cost few deaths among the participants. Indeed, if it can move Egypt to democracy, this movement, combined with social media, will be more subversive to autocratic regimes than Nasserism, Islamism or Baathism combined. Another editing miscue, but Friedman is a professional writer: shouldn’t “combined” imply “and” rather than “or”? Can Baathism be combined by itself? The hipster’s parenthetical insertion of “social media” is just precious. How did Iranians ever topple the Shah without Facebook? Israel should just look at the photograph of Friedman at the top of his column. The man reeks understanding. There will be ugliness aplenty in the days ahead as Egyptians are free to vent. Yeppers. Just ask Lara Logan. But at least other authentic voices, with a different, more hopeful song, are also emerging. The Arab tyrants, precisely because they were illegitimate, were the ones who fed their people hatred of Israel as a diversion. This implies that hatred for Israel is not a natural part of the diet of Arabs. Hence, Arabs have no real grievances against Jews and no conflicting interests, such as land, water rights, RELIGIOUS BELIEFS, etc. When the mob beat and sexually assaulted Lara Logan for 30 minutes while screaming “Jew” at her, that, too, was all Mubarak’s fault. If Israel could finalize a deal with the Palestinians, it will find that a more democratic Arab world is a more stable partner. If ethanol were a viable alternative to old-fashioned gasoline, we wouldn’t give nearly as much of a damn about the stability of the Arab world. If, if, if. Might make a good title for a poem, but in terms of the Middle East, the wistfulness of Friedman’s premise reminds me of Anse Bundren in Faulkner’s As I Lay Dying, who laments that the family will have to go into the water to get across a stream. Bundren just keeps repeating, “If the bridge was up, we could go across it.” Well, that bridge aint up. Anyway, Friedman just wrote that the problem is all that force-fed hate, so once the new democracies embrace the new civility that’s also catching on in good old American politics, it’s another rousing chorus of “Kumbaya” all around. Not because everyone will suddenly love Israel (they won’t). But because the voices that would continue calling for conflict would have legitimate competition, and democratically elected leaders will have to be much more responsive to their people’s priorities, which are for more schools not wars. The language of the democracy movement is US currency? …to build 10 world-class science and technology high schools — from Aswan to Alexandria. And that’s just the A’s! Kuwait, Saudi Arabia, a lot of other members of the Muslim “brotherhood” could provide 10 schools out of their Mercedes money. Unlike the US, they are not actually bankrupt themselves. Peeling off $100 million to build schools might be a good idea, but asserting it is the best way we can help without context is just fairy dust. Friedman exhibits the shopworn belief of throwing money at a problem and expecting that to fix it. Look how long we have been in Iraq and all the difficulties we have had with various infrastructure projects there—where at least in the beginning we were pretty much in charge. Look at Afghanistan, where Karzai is telling reconstruction teams to leave. We will give $100 million to the Egyptians…and they’ll decide how it’s spent. After all, the Egyptian Army has no external predators today. They are still next door to Libya and Muammar Gaddafi. Friedman’s logic is flawed in any case because it presents a false choice: if the US is wasting money by giving military aid to Egypt, it does not follow that instead we should be building Egyptian schools. Perhaps the Egyptians themselves, not Friedman, are the best judge of what enemies they have and how they should spend their money. On my way back from Tahrir Square on Saturday, I ran into five young Egyptians who were trying to wipe off “Leave Now, Mubarak” graffiti spray-painted on a stone wall. [NK: That’s what increased literacy will get you! No wonder tyrants are agin’ it….] You don’t see students removing graffiti very often, so I asked them why. “Because he is not our president anymore,” said a youth with the rubber gloves and solvent. They just didn’t want to see his name anymore — even as the object of an insult. Quintessential Friedman: Take a trivial anecdote and draw heady conclusions from it. Note that he expands on what the students actually said because he need not have asked them the question at all; they are only props for his point. They gave a matter-of-fact answer, and then he posits the real, Friedman explanation. As I kept walking to my hotel, I realized why. When I looked down at the Nile embankment — and this was central Cairo — all I saw was garbage strewn about, a crumbling sidewalk and weeds sprouting everywhere. I thought: If this were Sydney, Singapore or Istanbul, the government would have built a beautiful walkway along the banks of the Nile where Egyptians and visitors could stroll with families in the afternoon. Not here. Friedman envisions successful governance as making it more aesthetically satisfying for poseurs like him to stroll around gawking and ruminating. If Egypt—err, Cairo—were only a little more like Las Vegas…. And that in my view was Mubarak’s greatest crime against his people. He had no vision, no high aspiration, no will for great educational attainment. Mubarak let the sidewalks get dirty, the criminal. The Chinese, now they know how to run a railroad (even if a few dissenters disappear below the under carriage). That [the Mubaraks stole] is surely a crime, if true, but Mubarak is guilty of a much bigger, more profound, theft: all the wealth Egypt did not generate these past 30 years because of the poverty of his vision and the incompetence of his cronies. If Mubarak stole, yes, surely stealing is a crime; thanks for clearing that up. Friedman’s other bit of logic is a little less clear. Mubarak’s lack of vision held back all of Egypt, and remember that, according to Friedman, Egypt is responsible for the decay of the entire Arab world. It follows, then, everything bad in the Middle East for the past 30 years can be laid at the feet of Hosni Mubarak. Friedman sounds like the Cleveland Cavaliers fan who thinks the only problem with the NBA as a league is their team’s coach. “He is a pharaoh without a mummy,” the Egyptian playwright Ali Salem said to me of Mubarak. They can always fix that. 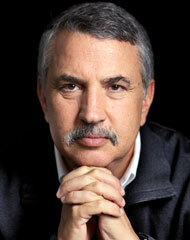 I’m glad I don’t have to read them all, although a few are bound to surpass a Thomas Friedman column.